The brother of the woman, Mohammed Asif Khan said that the agents promised that her sister would be given around Rs 25,000 per month in Riyadh, but she was given a job of a house maid. Haleem Unissa's mother shows her picture, asks for government's help to rescue her. 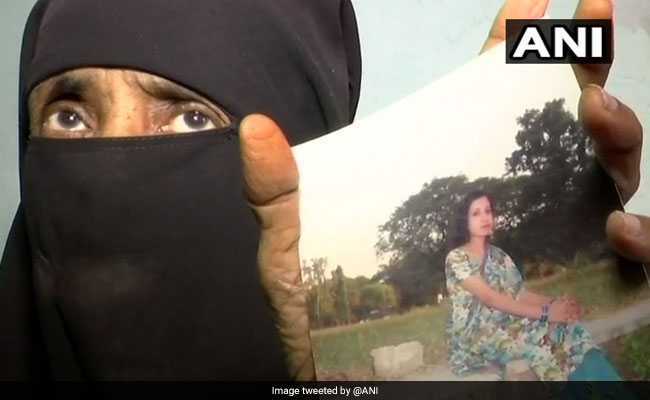 The mother of a Hyderabad-based woman, who has allegedly been trafficked to Saudi Arabia's Riyadh, has sought External Affairs Minister Sushma Swaraj's help to rescue her daughter. Habeeb Unissa told news agency ANI that her daughter was allegedly trafficked to Riyadh on the pretext of a job offer of a beautician by two agents. “My daughter, Haleem Unissa, went to Riyadh in March 2017. We don't know when she will return. She was sent there to work in a beauty parlor by two agents. She is being tortured there. We have also filed a police complaint. We request the government to help us,” the mother said. The brother of the woman, Mohammed Asif Khan said that the agents promised that her sister would be given around Rs 25,000 per month in Riyadh, but she was given a job of a house maid. He added that they asked the agents to bring her sister back, but they did not respond. Mr Khan said that they have even contacted the Indian Embassy for help.